Deep in the West End, Dr Camrose (Hamilton Dyce) is inspecting Farrar's (Bruno Barnabe) tonsils. Outside, Dexter and Preece (Dudley Sutton & Peter Bourne), chauffeur and postman, arrive in a Rolls Royce. 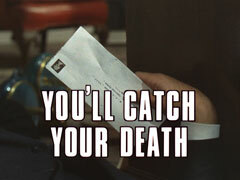 Dexter hands Preece a letter and he slips it through Camrose's door. 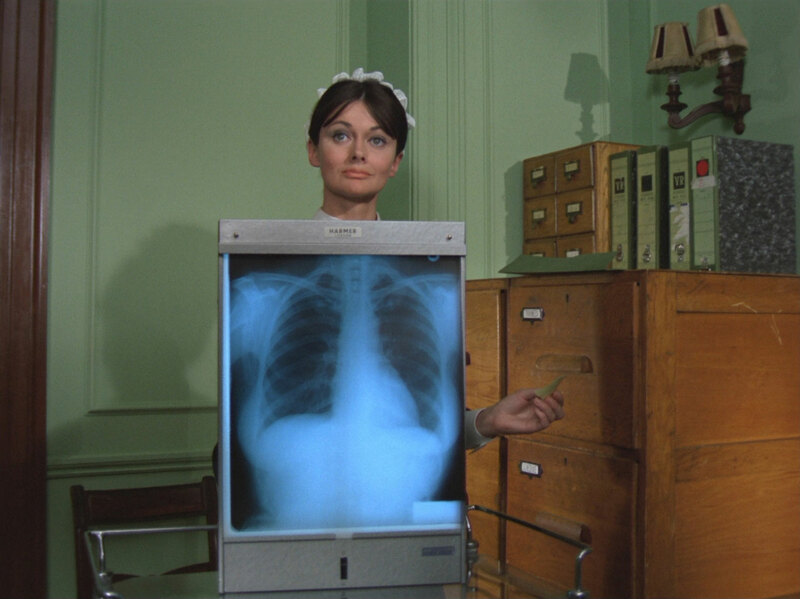 Janice (Fiona Hartford) picks it up and delivers it, but when the doctor slits it open, he finds that it appears to be empty. Moments later, he suffers a terrible coughing fit and falls to the floor, dead. Steed and Tara are summoned to see Mother (Patrick Newell) & Rhonda (Rhonda Parker) - in a disused reservoir - where he hands them a communiqué from New York - a third ear, nose and throat specialist has died, a worldwide epidemic is feared. Mother suspects it's no normal disease as it chooses its victims a bit too carefully - his nose is twitching. Steed comments that Mother's nose has never let them down and visits Camrose's office while Tara goes to see Padley, another specialist. Janice tells Steed the letter arrived just before Camrose's death and he notes there's no postmark, nor any letter. Meanwhile, Dexter and Preece arrive at the consulting rooms of Padley, Seaton and Herrick and deliver a letter; the real postman (Douglas Blackwell) being astonished to see Preece on his route. Padley's secretary, Georgina (Jennifer Clulow) delivers it to Padley (Willoughby Gray) while Tara waits to see him. They hear him burst into a fit of coughing and they're astonished to see him stagger out of his office and die in front of them. Tara takes the envelope and she and Steed discover the two are identical. Steed calls a stationer, Maidwell (Henry McGee), who confesses they're his budget range, "Cream Wove Bond". He says they sold 10,000 of them two months ago. "And no paper? ", asks Steed. Tara has gone to see Seaton (Geoffrey Chater), who tells he he's never seen anything like it; Padley had the symptoms of acute asphyxiation. Georgina delivers the mail, which Tara intercepts, but the suspect letter is not there. A few moments later, Seaton is crossing the hallway with Lord Nightingale's x-rays when the letter is delivered and he opens it. Once again, Tara is unable to save him, but she rushes outside and gives chase. Maidwell uncovers that the envelopes were delivered to the Anastasia Nursing Academy. Tara meanwhile chases the Rolls into the countryside but loses them and ends up being the quarry. 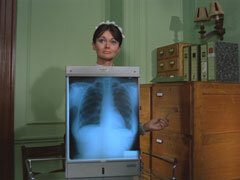 At the Academy, Melanie (Emma Cochrane) shows Steed in to see matron (Sylvia Kay). He tells her he wishes to find a worthy institution for an endowment and enquires into their paperwork - her claim of 50 letters a week contradicted by the clatter of a typing pool down the hall. Tara is tailed to Steed's flat and captured shortly after arranging to see Dr Fawcett from the Institute for Allergic Diseases. Steed returns later, finding Dr Fawcett (Charles Lloyd Pack) in his apartment, wearing a handkerchief over his face. Fawcett tells him off for having velvet curtains but when Steed discovers Dexter's chloroform bottle he bustles Fawcett out and rushes off to see Mother. Steed breaks into the academy that night and finds a letter on matron's desk from a Colonel Timothy, predicting their "final victory". Mother says Timothy is clean but Steed plans to check him out nonetheless. Preece and Dexter dump Tara in on a bed while Steed discovers two crates of envelopes at Timothy's. He's searching the desk when the butler (Valentine Dyall) interrupts him. Steed excuses his presence and is asked to submit to an antibiotic injection, then introduced to the Colonel, a man susceptible to Western diseases since his return from Malaya. Steed asks him about the academy but he dismisses it as troublesome and boring. 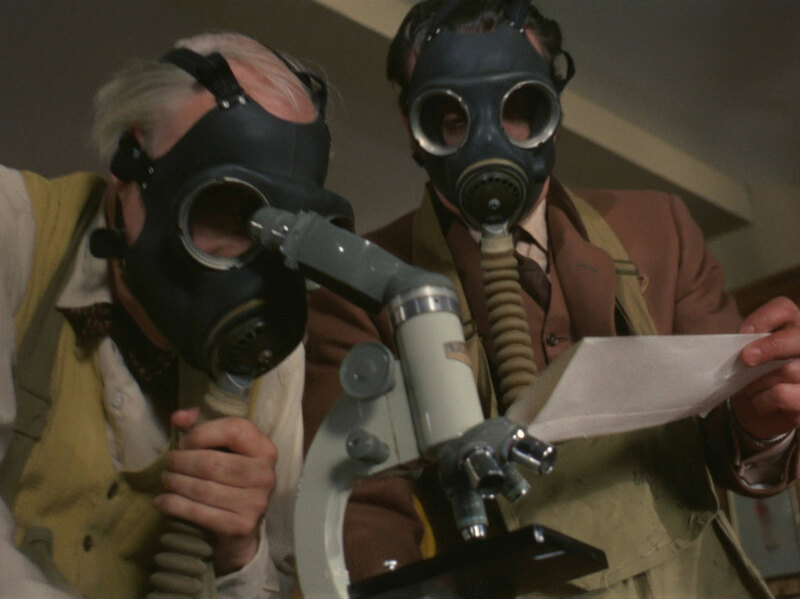 The colonel shows him, instead, the research facilities inside the house, dominated by a giant nose attached to the main wall, and introduces him to Dr Glover, his head of research, (Fulton Mackay) who leads him to the labs. Steed stops at the door of Tara's cell and asks what's inside and Timothy tells him it's a deep-freeze room, currently empty. Glover leads him away to another of them, where some men are being subjected to low temperatures to test resistance to the cold. He's then shown the allergy room and comments on the nurses, whereupon Timothy says Glover insists on only using Anastasia nurses. Preece sets off to deliver a letter to Herrick and a short time later Steed notices the message "Contact Herrick" on Timothy's notepad. He asks him about the other specialists and Timothy admits contacting them, but never received any response. Steed tries to contact Herrick (Andrew Laurence), just missing him at the office and Preece leaves the letter in Herrick's car; the doctor opens the envelope then crashes his car when attacked by a fit of sneezing. Tara meanwhile, trying to keep herself warm, spots a ventilator in her room and blows it open with a bomb contrived from potassium chlorate and ether she finds in a medicine cabinet, escaping her room. Fawcett arrives, finding Steed has opened the envelope - wearing a gas mask - and is given a mask to wear. They examine the envelope and determine it contains a highly concentrated common cold virus powder. 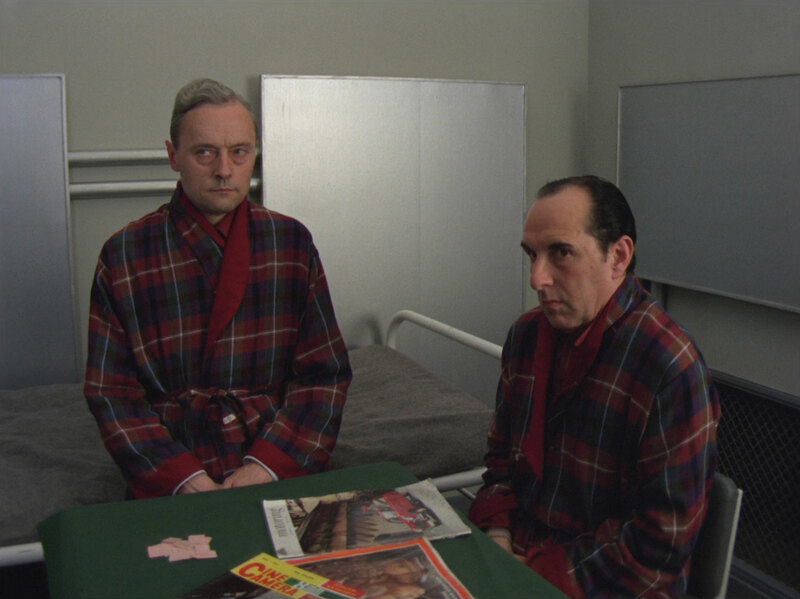 The specialists had been targeted because they were all working on anti-viral research; Steed realises Timothy's labs could produce the powder and sets off to where Tara, hiding inside the nose, overhears the villains say he has been dealt with and they need a guinea pig for one last test. She sneezes, falls out, is recaptured and marched away to be dealt with by 'the chief'. Steed arrives and accuses Timothy of being behind the plot - until the butler produces one of the deadly envelopes, addressed to his master. Glover meanwhile is preparing Tara for a shot of the übervirus and tells her no-one has resistance to it - yet. He can destroy a whole population with a few grams of powder and intends to sell to the highest bidder. Steed and Timothy dispense with Dexter but are held at gunpoint by Preece as Glover prepares to inject Tara. Preece is dealt with thanks to their common military knowledge and they arrive just as Glover is kicked to the ground by Tara. She puts matron in a headlock with her legs as they enter but Glover escapes by threatening them with a vial of serum. Timothy helps Tara down while Steed chases Glover through Tara's ventilator shaft. 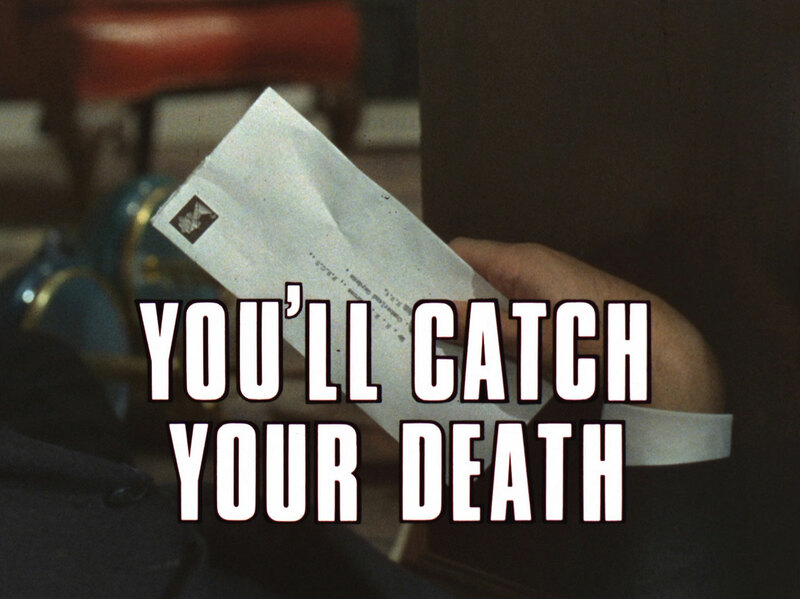 He corners him in the nose and drops an envelope down on him - killing Glover with his own medicine. Back at his flat, Steed prepares Tara some of his Auntie Ermintrude's patent cold cure, then admits his aunt died from a cold. He says it wouldn't do for them both to have a cold at the same time, as people might talk - then sneezes and draws out a foot bath to set alongside Tara's; she laughs that he is hopelessly compromised.